Accurately Identify Your ERP Requirements. Save More Time When Evaluating Vendor ERP System RFP Responses! Ensure ERP Support Health Care Reform Bill Compliance. 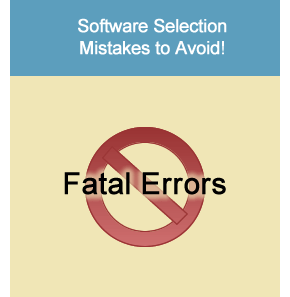 Increase ERP selection accuracy! Use this easily customized non-manufacturing enterprise resource planning (ERP) RFP Master containing thousands of ERP selection criteria to query vendors about how well their manufacturing ERP system features fit your needs. All criteria are organized to ensure consistent "Apples-to-Apples" comparison and evaluation of vendor ERP RFP responses based on your actual requirements. All with a 30 Day Money-Back Guarantee! 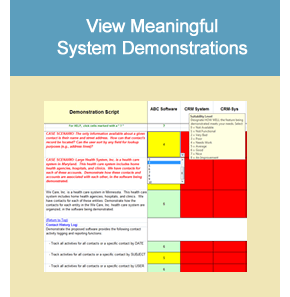 Easily identify all pricing discount and other vendor concession opportunities by using the Best and Final Offer (BAFO) capabilities included in this RFP template to help ensure you obtain the best system for the least cost. To view a DETAILED list of the criteria categories in this RFP. Quickly Identify the Functions & Features You Need - No Need to Start from Scratch! Send a Needs Survey to Users - Jog User Memory & Gather Unique User Needs in Detail! instead of Ambiguous, easily Mis-Understood "Feature-Speak"
for ensuring ERP software vendors fully understand your organization's needs & goals. and Also HOW It will Be Delivered. A RISK Assessment Score is Assigned to Each Feature's Delivery Method. Overall Supportability is Determined from Total Risk Assessment Score. Track Implementation Progress & Payments Using "Earned Value Management" Techniques. INCLUDED with this ERP RFP Master ™ is a full set of Vendor RFP Response (Proposal) Evaluation functions for ERP non-manufacturing that enable extremely accurate and precise evaluation of vendor ERP software proposals. All evaluation functions can be tailored to utilize your organization's actual business priorities and operate at the detail feature level. For more information on these non-manufactuuring erp response evaluation & comparison tools Click Here! DOWNLOAD a FREE SAMPLE RFP HERE! This live working Non-Manufacturing ERP software RFP sample has been ZIPPED for fast download. Although not required, we recommend you SAVE it to your hard drive, then UNZIP the RFP, prior to use. Purchase and download the full ERP Software RFP Master for Non-Manufacturing Enterprises by clicking the "Add to Cart" button below to use our online order form and Secure Checkout. No Limit on Staff Users, Vendors or Projects! Looking for a local consultant to help with your ERP software selection project? An Infotivity-certified consultant offers the expertise and resources needed to provide valuable assistance at every step of your ERP system selection process! Let us recommend a certified ERP software selection consultant! Return to the TOP of the Non Manufacturing ERP Software Selection Page. ALL the tools & features described above, i.e., everything needed to accurately identify non manufacturing ERP user needs, quickly determine ERP system requirements for non manufacturings, prepare and distribute an RFP, compare & evaluate vendor RFP responses (proposals), and select the best TMS/WMS software system for your organization's needs, are included in or with each RFP Template!